Properties in City of Greater Geraldton average 4.5 out of 5 stars. 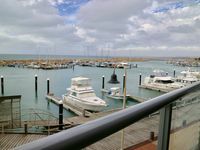 Property 5: Geraldton Marina - Family Beach Holiday House. Property 13: Perfect and Private! Property 24: Downstairs at Green: Executive apartment. Property 27: Outdoor pets are welcome, plenty of shade, shelter and large secure yard. We hope you enjoy our - space, decor, location! Property 47: We hope you enjoy our - space, decor, location! Very nice apartment in relaxing surrounding...a true gentleman! The owner took very good care, the apartment was very clean and we'll equipped. And the location was perfect! Everything you need for your Geraldton stay. Great location as handy to everywhere. Property is neat, clean, secure and quiet. The house has what you need for a enjoyable stay and lots of space. We will be back.